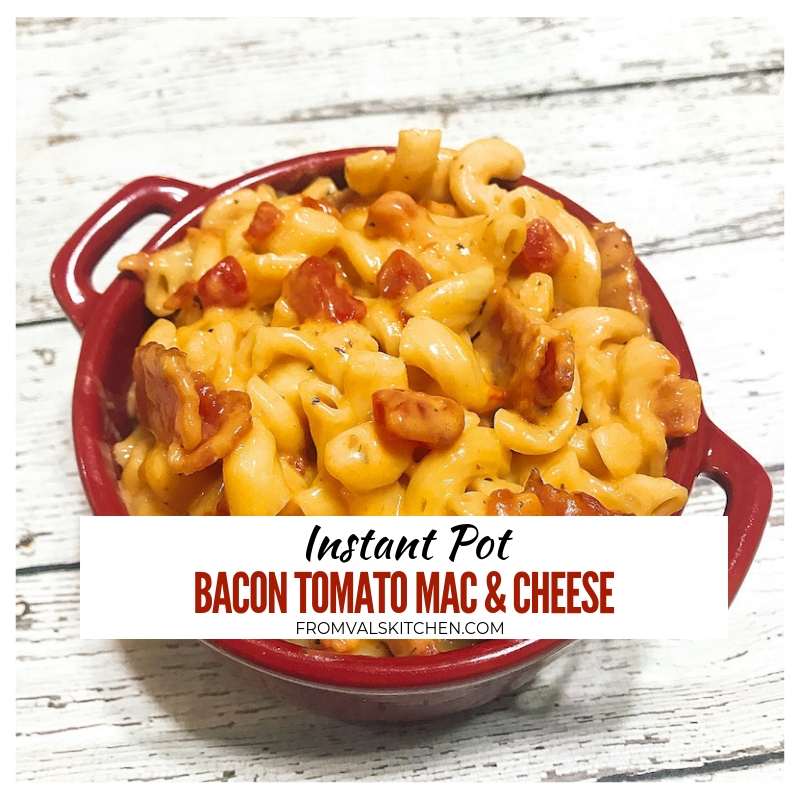 Instant Pot Bacon Tomato Mac And Cheese is a creamy comfort food that works as a side or main. This simple one-pot recipe will become a family favorite. How do you take one of everyone’s favorite comfort foods and make it even better? Add bacon of course! 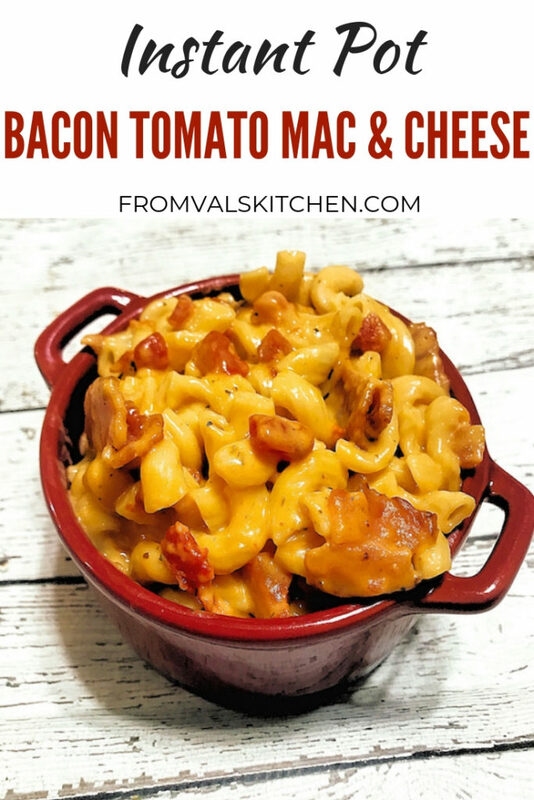 Bacon Tomato Mac And Cheese is a creamy bowl of comfort food that works perfectly as a side or main dish. You’re surely familiar with the super popular BLT sandwich, so you already know how well bacon and tomato go together. Adding tomatoes gives a flavor boost to this cheesy dish. This simple recipe results in a flavorful dish that will become a family favorite. Some of the posts on this site, such as this one, contain an affiliate link. This means I MAY get paid a VERY SMALL commission if you purchase the product or service. Plug the Instant Pot pressure cooker in and select the saute setting. Place the bacon into the pot. Stirring occasionally with a silicone slotted spoon, saute the bacon until it’s cooked, which will take somewhere between 15-20 minutes. If you want to skip this step use precooked bacon or cook the bacon another way. Once the bacon is cooked, remove it from the pot with a handheld strainer and set aside on paper towels. If you are using the regular pot and not the nonstick pot you will need to deglaze or clean the bottom of the pot. It is very possible and somewhat likely that the bottom of the pot will have a layer of bacon bits and grease. This layer is quickly and easily removed using soap and water. Dry the pot thoroughly before returning to the base of the pressure cooker. Pour the broth into the pot. Add the elbow macaroni to the pot, making sure as much of it as possible is covered with broth. Drain most of the liquid from the diced tomatoes and add the tomatoes to the pot. Add the Italian seasoning to the pot and gently stir into the broth. Put the cover onto the pressure cooker and set to cook on manual high pressure for 5 minutes. Once the cooking time has ended do a quick pressure release. Pour the cream into the pot. Add the shredded cheese to the pot. Stir well with a silicone cooking spoon until the cheese has melted and become smooth. Add the bacon to the pot. Plug the pressure cooker in and select the saute setting. Cut the bacon into pieces. (I usually work about 3 strips at a time, cutting the batch of 3 into 8-9 pieces each using kitchen shears.) Place the bacon into the pot. Stirring occasionally with a silicone slotted spoon, saute the bacon until it's cooked, which will take somewhere between 15-20 minutes. If you want to skip this step use precooked bacon or cook the bacon another way. Once the bacon is cooked, remove it from the pot and set aside on paper towels. If you are using the regular pot and not the nonstick pot you will need to deglaze or clean the bottom of the pot. It is very possible and somewhat likely that the bottom of the pot will have a layer of bacon bits and grease. This layer is quickly and easily removed using soap and water. Dry the pot thoroughly before returning to the base of the pressure cooker. Pour the broth into the pot. Add the elbow macaroni to the pot, making sure as much of it as possible is covered with broth. Drain most of the liquid from the diced tomatoes and add the tomatoes to the pot. Add the seasoning to the pot and gently stir into the broth. Put the cover onto the pressure cooker and set to cook on manual high pressure for 5 minutes. Once the cooking time has ended do a quick pressure release. Pour the cream into the pot. Add the shredded cheese to the pot. Stir well until the cheese has melted and become smooth. Add the bacon to the pot. Stir immediately. Serve and enjoy! I'm a Jersey girl, I was born and raised here and have lived here for almost my entire life. I'm a mom of 2 boys – TJ, a 23 year old, and CJ, an 19 year old with Down Syndrome. I am the oldest of four children. 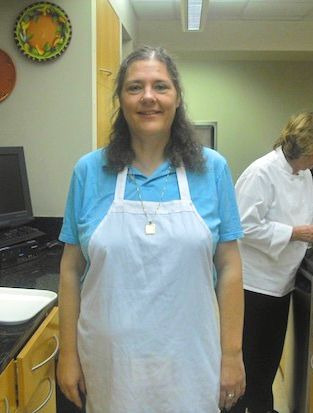 I am also a social media enthusiast, cat person, and Down syndrome advocate. I love coffee and milkshakes. My favorite dessert is cheesecake. I love rock music, tech, travel and food. And cheesecake. I HATE the misuse of the word retarded. I take it personally and find it very offensive. Did I mention that I love cheesecake? Hi! I'm Valerie. From Val's Kitchen brings you recipes, foods and cooking products that let you create a tasty meal without tons of time or special knowledge. For press invites & pitches, please email valmg2 (AT) gmail.com. Subscribe to our feed and newsletter to keep up with the latest news! 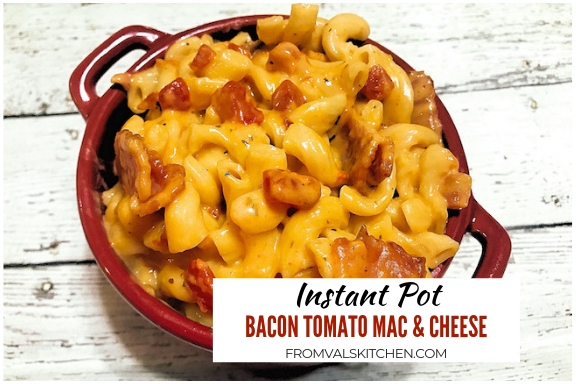 From Val’s Kitchen is a participant in the Amazon Services LLC Associates Program, an affiliate advertising program designed to provide a means for us to earn fees by linking to Amazon.com and affiliated sites.